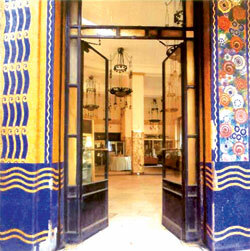 Once a magnet for Egypt’s high society when it was considered the world’s Ritziest tea room, Groppi, set in Cairo’s Talaat Harb Square, still retains its original mystique although its interior is somewhat faded. Groppi’s, the creation of Swiss pastry maker Giacomo Groppi, has been featured in countless films and extensively written-about. Groppi stands as a living legend and is still a magnet for visitors to Cairo today. It symbolizes a never to return era; a time of great wealth and ostentation; the days of the Egypt’s kings, princes, pashas, beys and cotton magnets when the Egyptian pound was worth more than either sterling or the dollar. It was once a place of political intrigue, a venue where historic deals were done and a beloved haunt of authors, journalists, artists, movie stars and socialites eager to be seen. Those who remember that glittering era first hand are dwindling. The few who still remember wax lyrical about those good old days. Architect Chafik Nakhla, recalls what Groppi once symbolised for him. “Oh how I loved Groppi,” he said with a far-away look in his eyes. Throughout the 1950s, when we lived in Assiut, we regularly spent our summers in Alexandria. En route, we would usually stop for a week at the Shepheard’s Hotel in Cairo. Now steeped in memories of a gentler era, Chafik enthused over Groppi’s Petit Suisse (sweet fromage frais) and its marrons glacés “better than any in Paris”. It was then his wife Marian, an English-language teacher at the American University of Cairo, joined him on his trip down memory lane. 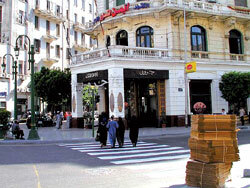 Adel Toppozada, former Deputy Minister of Information and grandson of former Egyptian Prime Minister Hussein Pasha Rushdy, describes the area around Talat Harb during his youth, as “extraordinary”. “Kamel Shenawi the journalist and poet had his own table and I often spotted the author Taufik Al-Hakim, who had a reputation for being a misogynist”. “During WWII, Groppi’s on Adly Pasha Street (a second branch of Groppi’s) was frequented by members of Britain’s Eighth Army and was a favourite of General Montgomery, who came to enjoy jazz evenings in the garden,” says Toppozada. Indeed, Colonel David Sutherland, who was characterised by Dirk Bogarde in the WWII movie “They who Dare”, recounts in his memoirs how he treated two German prisoners to tea at Groppi’s before turning them over to British interrogators. How cruel was that? Oh how those men must have suffered during their incarceration longing for those delicious flavours and refined ambience that encapsulated Groppi’s of the day. A biography of Admiral Sir Horace Law, a descendant of Horatio Nelson, describes how guests at Law’s wedding party marvelled at a cake made by Groppi’s, the like of which hadn’t been seen in London for years. But the British weren’t the only ones milling around Groppi’s during the war. According to a statement signed by a Fascist spy Theodore John William Schurch, a Swiss national who was incarcerated by the British, Groppi’s was the venue for meetings with his Italian recruiter. And according to SS archived microfilm, Hitler’s right-hand man Adolph Eichmann visited Cairo in 1937, where he met with a member of the Haganah on October 10 and 11 at Groppi’s – a meeting that some chroniclers of history would prefer to erase. In 1952, due to its British army clientele, Groppi’s tea room narrowly escaped destruction. An anonymous eyewitness recounts the day Egyptian protestors almost burned it down. But Groppi’s swiftly recovered and in later years during the 50s” it was fashionable to take breakfast at Groppi’s side-by-side with pashas, famous politicians, artists, writers and editors, such as Ali Amin, Mustapha Amin and Mohammed Al-Tabei,” says Toppozada. Former UNESCO official and Secretary-General of the Aga Khan Foundation Said Zulficar, who lives in France, has rather less pleasant memories of breakfast at Groppi’s. “One morning, the Secret Police raided Groppi and arrested the whole crowd under the accusation (totally trumped up) that the French team was plotting with their Egyptian breakfast colleagues to overthrow the regime. They were imprisoned for over six months but in the end they were all released as there was no proof of any such conspiracy”. “I never resumed my daily breakfasts at Groppi’s, nor have I ever returned to the Tulip Hotel, which is still there”, says Zulficar. In his book “Cairo: the City Victorious” Max Rodenbeck describes the ambience of Groppi’s Tea Rooms and the nearby Café Riche, which both had its share of “leftist conspirators and secret police…”. In 1981, Groppi was sold to Abdul-Aziz Lokma, founder of the Lokma Group, its present owners, explains Khalim A. El-Khadem, Groppi’s current General Manager. It was then that the bar was closed down and the sale of alcohol banned. El-Khadem told me that Giacomo Groppi was the first to introduce Egypt to crème-chantilly and ice-cream and his chocolates were of such fine quality they received world-wide renown. King Farouk was so impressed with the excellence of Groppi’s chocolates that during WWII he sent 100 kilograms as a present to King George for his daughters the princesses Elizabeth and Margaret. These, says El-Khadem, were put on a ship which avoided German submarines by taking a circuitous route from Egypt to London via West Africa, Spain, France, Belgium and Scotland. Incredibly, they arrived intact. The patisserie, the chocolates, the marrons glacés and the jams were made in Groppi’s factory which still stands today complete with original machines. “The manufacturing processes were kept strictly secret,” says El-Khadem. El-Khadem admits that not all of Groppi’s products today are made according to the original recipes because consumer demands have changed. He recalls the days when the former head of Egypt’s Wafd Party Fouad Serageldin was a regular of the Adly Pasha branch, and remembers how the Nobel Prize recipient author Naguib Mahfouz would frequently stop by Groppi’s tea house to read the newspapers. It’s a pity that walls can’t talk. Groppi’s encapsulates almost 100 years of Egypt’s history and an elegant, sophisticated milieu that no longer exists; except, that is, in the fading memories of those who were privileged to have been part of that glittering and exciting world. 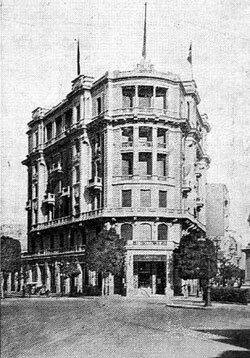 Sadly there is little doubt that one day all that will remain of Egypt’s Belle Époque and Groppi’s glory days will be found on celluloid or deep within the pages of novels and biographies. Is the US-UK special Relationship Still Special? How to End Our Disaster in Iraq? Copyright © 2007 Al Habtoor Group. All Rights Reserved.